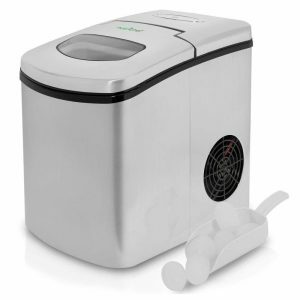 NutriChef PICEM25 is the new release upgraded version of the previous NutriChef Ice Maker. This stainless steel ice machine is a heavy-duty, sturdy, digital, electric and portable unit that can be used both as built-in or on the countertop. The rating is 3.9 out of 5 stars by 23 customers at the moment and we’ll have a look at the pros and cons through the customer experiences. The stainless steel exterior looks nice and premium, makes the unit more durable and is stain-resistant. 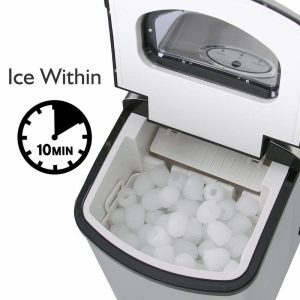 This ice maker runs quietly and produces ice quickly in about ten minutes. It has a convenient LED-backlit touch button display panel with On/Off button and Ice Full, Ice and Add Water indicators. With the hassle-free operation, you simply put some water in, press the On/Off button and let it make the ice cubes. There is a convenient see-through window that lets you view the ice production and levels. And the digital touch button control panel tells you when the ice tray is full or when you need to put some water in with the LED indicator lights. With a 22 pounds of ice making capacity a day of the high power freezing element you can refill your ice buckets when you’re entertaining guests in parties. You can choose from three different ice cube sizes, of large, medium and small and they’re all pellet shaped. It comes with a convenient hand scoop ice shovel and you can restock the cooler with the large size ice and use the small cubes in your beverages. The stain-resistant stainless steel exterior is easy to wipe with a damp cloth. It comes with a 4.6 feet long power cord and as a portable ice maker you can use it at home or take it wherever you want- office, beach, boat, pool etc. The integrated water reservoir has a water holding capacity of 1.7 liters. The stainless steel NutriChef PICEM25 weighs 24.16 pounds and measures 9.5 x 12.9 x 14.1 inches. Once the ice cube bucket is full and the ice maker turns off the ice shall start melting depending on the ambient temperature. This means you need to remove the ice after it completes a cycle. But if the unit stays on, the ice cubes will stay as cold and frozen for up to two hours. If they melt it will take the unit another ten minutes to make a new batch of ice. You’ll find a drain plug just at the bottom of the water tank just underneath the ice tray. And you can put another container underneath and detach the plug. The NutriChef PICEM25 Ice Maker doesn’t come with a car charger and is compatible with the US and Canadian power outlets. It is smaller in size than some other competitor models on the market but makes the same ice at the same amount of time. The estimated annual energy consumption is much below the cost range of similar competing models. Upgraded version means this model comes with a digital panel with the Ice Full and Add Water functions and indicators. This upgraded ice maker comes with the Amazon product support free of charge. It offers good value for money despite the small cons reported by the customers. You may want to examine for yourself on the Amazon product page.